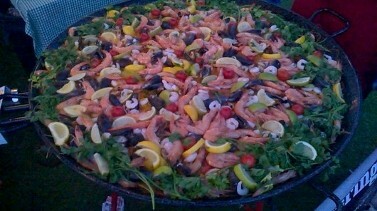 Our giant sized paella pan catering in Sheffield is always really popular with guests and never fails to impress as our paella pan caterers arrive in good time to set up and get cooking your chosen menu from scratch so that guests if they like can see all the flavours and ingredients coming together in the pan before being served straight from it, then after seconds our Sheffield catering team will collect in plates and rubbish from guests so that all our clients have to do is relax and enjoy themselves all stress and hassle free. Beef mince cooked with fresh mixed chilies, red onions & peppers blended with tomatoes, kidney beans and finished with Mexican spices & herbs. King prawns, crab, mussels & optional cockles cooked with a mix of peppers, red onions, paprika, saffron & garlic all slowly cooked in traditional Spanish paella rice. 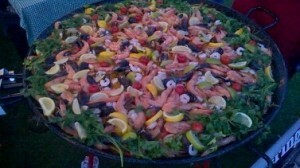 Topped with giant king prawns and fresh lemon & parsley. Marinated chicken breast & chorizo cooked with sweet peppers, red onions with paprika, saffron & garlic braised with traditional Spanish rice topped with Serrano Ham & Olives. 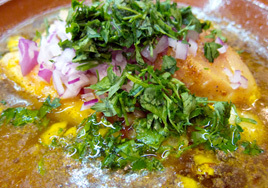 Sizzling chicken cooked in lots of Mexican spices, with red & yellow peppers and onion. Served in soft flour fajitas wraps. 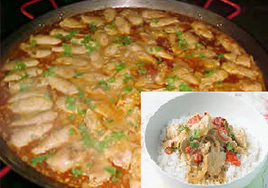 Chicken breast with onions, mushrooms, red & green peppers, tomatoes, seasoned with lemon grass, garlic and coconut milk. 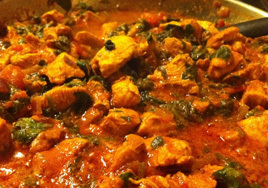 Marinated chicken breast cooked with fresh chilies, red onions, mix of peppers, coriander, Indian spices & Herbs. You can specify mild, medium or hot! Prime minced lamb cooked with red onions, fresh mint, yellow & red peppers and tomatoes marinated together in a blend of cumin, paprika and coriander. Min guest numbers of 50 apply to all big pan menus. Big Pan Catering is perfect for any special occasion, and perfect for wedding catering, or maybe you’re having a party in a different setting like your garden, then big pan catering is ideal. We are registered wedding caterers and outside caterers providing professional catering for birthdays, christenings, weddings and other types of private and corporate parties and events. 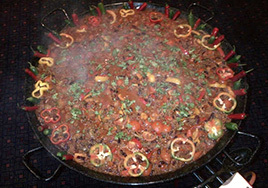 Our traditional giant 4ft and 5ft Big Pans are sourced in Spain and we have them brought back to ensure authenticity of our Big Pan catering. 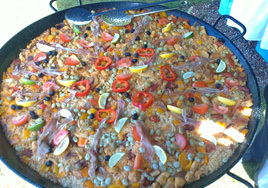 The experience is fantastic for guests as they see all the ingredients come together being cooked in front of them by our paella pan caterers, with the smells of ingredients infusing together with and then finally being served straight from the giant pan to your guests, this enables us to offer a service and menu range otherwise not available from other caterers, making our Big Pan catering ideal for your event or any event. All menus come with quality disposable crockery and cutlery, but why not upgrade to 8″ porcelain plates and stainless steel cutlery or 10″ porcelain plates and stainless bead design cutlery. We also offer upgrades on dessert bowls and stainless steel spoons. Ask us about availability and pricing. Hello, for enquiries or to get a quote just fill in this quick form and we'll get back to you. Thank you. 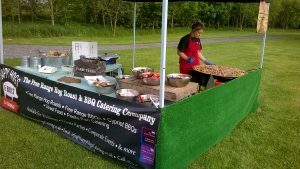 Copyright © 2019 | Hog Roast and Barbecue Caterers Sheffield, Happy Hogs and BBQ Caterers Yorkshire. 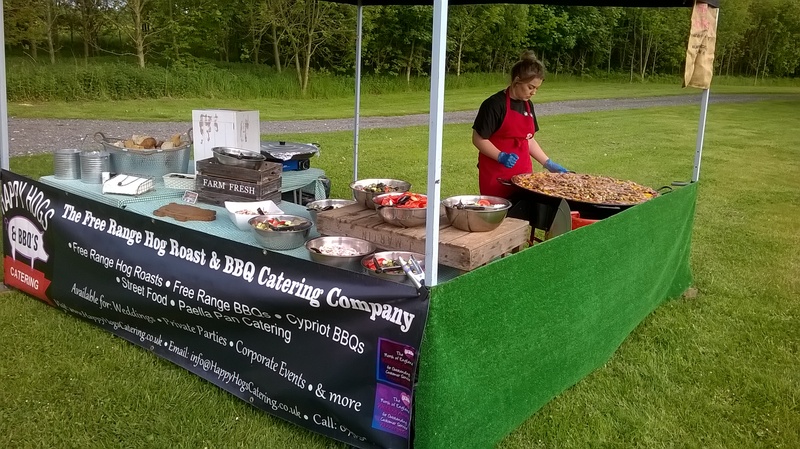 Free Range Hog Roast and Barbeque Catering.